A public protest has been held in Inverness following the deaths of 19 birds of prey in Ross-shire. Tests have confirmed 12 of the 19 birds were poisoned. 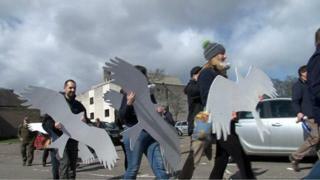 Scores of people marched to the city of Inverness over the deaths of 14 red kites and five buzzards. The birds have been found near Conon Bridge since 18 March. Nineteen white cut-outs of birds dubbed "ghost raptors" were displayed during the event. RSPB vice president Sir John Lister-Kaye, who attended the rally, said: "This incident is an outrage and the public are right to be angry. "Poisoning is unacceptable and we call on the Scottish government and the police to stamp it out." Protester Andrea Goddard said: "If the public, RSPB and the authorities can pool our collective sadness and anger at this atrocity we may be able to effect real and lasting change. It's time for action." Police Scotland, RSPB Scotland, Scottish SPCA and Scottish Natural Heritage (SNH) have been involved in investigating the deaths. Members of the landowners organisation, Scottish Land & Estates, and NFU Scotland have contributed £12,000 towards a reward for information leading to the prosecution of whoever is responsible for the poisonings. Many of the red kites were tagged when they were chicks as part of a conservation project. They include a 16-year-old female kite tagged in 1998. On Friday, SNH chairman Ian Ross has described the deaths as "shocking, grim and distressing". The killings threatened Scotland's appeal as a wildlife tourism destination, he added. Nature-based tourism is said to be worth £1.4bn a year to the Scottish economy.